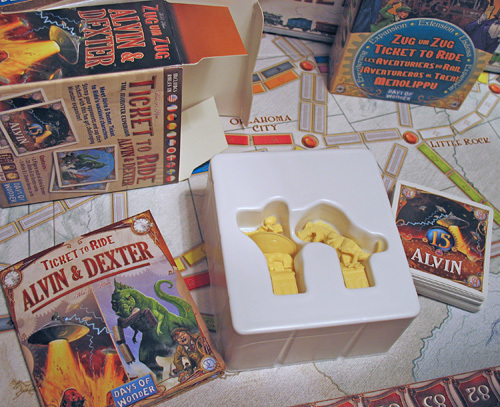 Review: "Ticket to Ride: Alvin & Dexter Monster Expansion"
If you follow Amy & I via social media like Facebook, or even keep up with our activities here on the blog, you know that we're big fans of the boardgame Ticket to Ride. 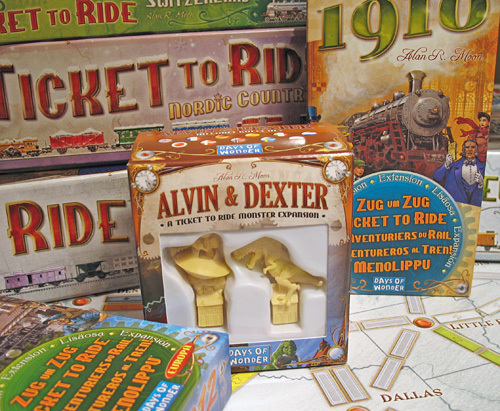 Since first picking up the original game in the fall of 2009, we've added the Mystery Train and USA 1910 Expansions, Ticket to Ride Europe and its companion Europa 1912 Expansion, Ticket to Ride Nordic Countries, and Ticket to Ride Switzerland. There are still other games in the series that we haven't explored, but our minds were sort of blown when back in December rumors started leaking about another expansion… involving aliens and monsters? Surely this wasn't the case of completely throwing the theme of a turn-of-the-century railroad game out the window. But in fact, it was true! And you know what? It's a great idea! 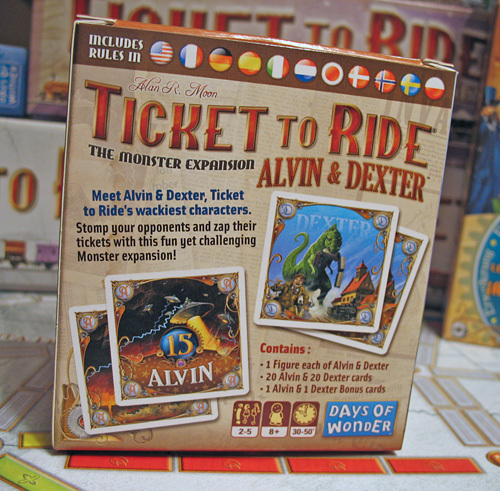 So what is exactly the "Ticket to Ride: Alvin & Dexter Monster Expansion"? Well, it's basically a really small box for $15. Inside you'll find 2 plastic figures, a rule book, and a stack of cards. And that's pretty much it. 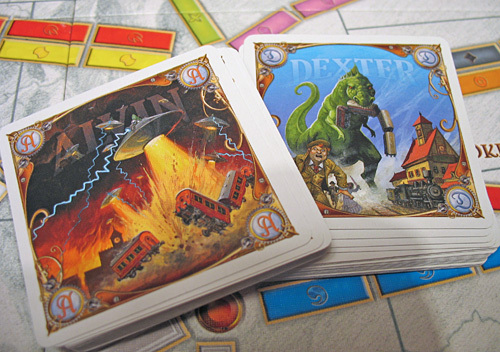 Meet Alvin & Dexter – two detailed monster figures that bring their own special brand of chaos to cities across the Ticket to Ride landscape. 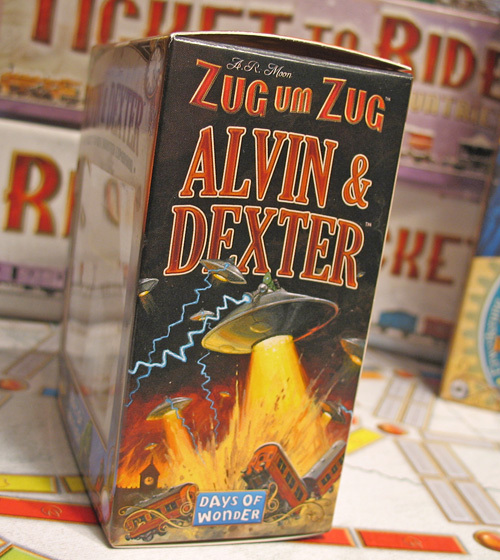 Alvin (the Alien) and Dexter (the Dinosaur) are two wacky characters ready to help you stomp opponents and zap tickets in this fun expansion. But don't take them too lightly; they also introduce a devious new tactical layer to the game. In effect, what Alvin & Dexter represents is the ability to screw over your opponents using a method besides just blocking a route they wanted. Alvin & Dexter introduces another level of strategy which I personally feel revolutionizes the game a bit, despite the odd theme of monsters. The beauty is that this expansion can be added to any version of the game, so it's a valuable compliment to your existing Ticket to Ride collection. 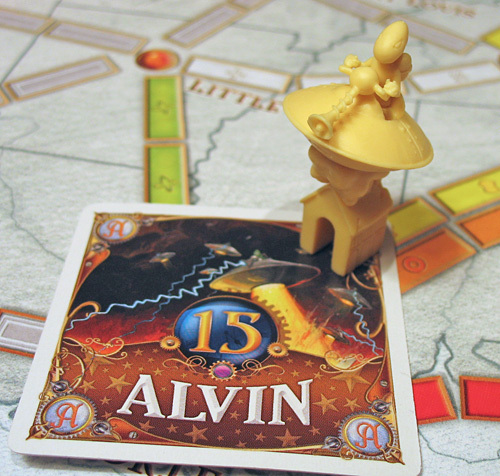 At the start of the game, after you have selected Destination Tickets, one player sticks the Alvin pawn on any city on the board. Another player then places Dexter on another city. Then the game begins as normal. Now, during gameplay, you cannot build a route into or out of any city that has either Alvin or Dexter sitting on top of it. They are each considered a "City in Chaos," apparently because they are being terrorized by aliens and monsters. This greatly changes the way you may plot a route on the board. When you move either monster, you then take a card that matches their name and place it in front of you, basically making a collection of your moves. It also indicates that monster was moved during that round of turns, preventing it from being moved by someone else until the next round. Now, you would think that you could just avoid the monsters, working around their path and not really caring to move them. But you'd be wrong. While you don't have to be actively moving them all the time (though it's a good idea), you do have to be aware of how they are affecting your game. In the end, it will matter a great deal. When the game ends, any Destination Tickets that list a city that just so happens to be the place where either Alvin or Dexter ended up… well, they are only worth HALF their original value. So in many ways, it's to your advantage to keep moving these monsters around the board, perhaps in the hope that you can hurt your opponent's final Destination Ticket values at the end. This mechanic can also work to your advantage if you discover that you have some Destination Tickets that you are unable to complete, and thus will count negatively against you. By parking Alvin or Dexter on one of the cities found on your card, you cut your negative value by half as well! The monster-oriented strategy is extended with additional points as well. At the end of the game, one 15-point Alvin Bonus Card and one 15-point Dexter Bonus Card are awarded to the persons who moved each monster the most times (that's why you track their moves by picking up a monster card and placing it in front of you during the game). If you manage to move both monsters the most and collect both Bonus Cards, that could be a 30-point swing, more than any Longest Route or other bonus, which could significantly change who wins a game. The third Ticket to Ride map I designed was Japan, back in 2005. At that time, Days of Wonder was trying to license the game to a Japanese company and we assumed they would want a Japanese map rather than the USA or Europe maps. In the end though, Bandai decided to put the USA map in their edition. My Japan map included Godzilla right from the start. It just seemed like a natural fit to me. Part of the inspiration came from my enjoyment of playing Manhattan with the Godzilla rules. As time went by, it seemed like the Japan map wasn't going to be published, so I suggested to Days of Wonder that we publish a small Monster Expansion for all the maps instead. They tested my first prototype and didn't think it was enough, so I went back to work. I added a second Monster (originally Rodan), changed the way the Monsters were moved on the board, and much more. I don't know how many different versions I tested, but this last one is definitely the most fun. The addition of the Monster Cards, and giving the player who moves each monster points at the end of the game, was the final step. Maybe one day we'll see that infamous Japan map that Alan talked about, perhaps as part of the future planned release of a Ticket to Ride Map Collection. In any case, once he shared this story, the goofy addition of monsters to the game made a whole lot more sense. Now that you've read about how this expansion works and even the backstory on how it came to be, what's my take? Is it a crazy theme with monsters going after trains and cities from the 1900s? Yes, completely so. You could have used anything else to fit the theme better, such as weather or maybe a transit strike. But would you buy a "Bad Weather" or "Economic Crisis" expansion to the game? Monsters and aliens are so weird that it just works. The key here is that the new game mechanic found in Alvin & Dexter is excellent. With the ability to dramatically alter what your opponents are doing, I'm keen to look beyond the goofy names and monster toys. 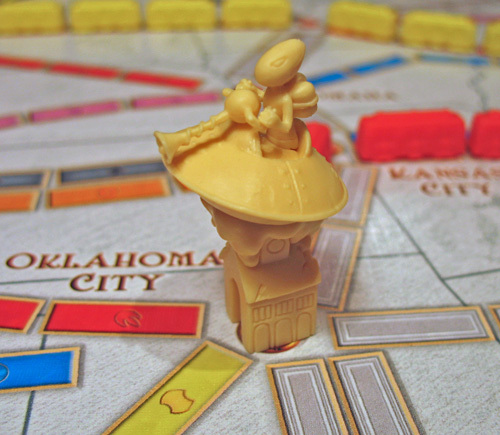 The gameplay is refreshing and innovative, and it adds a breath of fresh air to any version of Ticket to Ride you own. I'm quite curious to see how it changes up Nordic Countries and Switzerland, since Locomotive cards are much easier to come by vs. the original US or Europe versions. Probably my biggest gripe with Alvin & Dexter has to do with the packaging. The box it comes in is very small and seems to be designed more for showcasing the figures on a store shelf. However, it's not very practical for long-term storage or constant use. 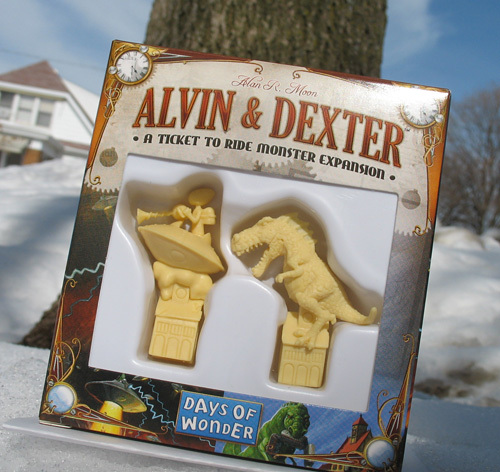 Inside you basically find an plastic insert that snugly holds the Alvin & Dexter plastic figures. In the hollow area under this insert, the stack of cards and the rule book are tucked away. It's rather a pain to get all back together, to be honest. A box like the ones used with the USA 1910 or Europa 1912 expansions would have been more practical solutions for a game owner in this case. I'm still not sure what the best storage option will be for me regarding this thing. Should you pick up Alvin & Dexter? Unlike an expansion like USA 1910, which I believe brings vital fixes to the game, this monster expansion is more like an extra cherry on top of an already awesome ice cream sundae. If you are tired of plain vanilla Ticket to Ride, it's a good option. 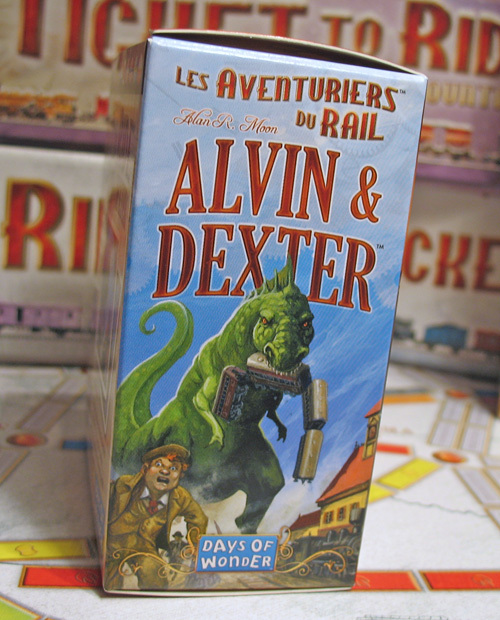 If you want more cutthroat competition and fierceness in your gameplay, Alvin & Dexter is a great addition. Is there a fascination in your marriage to sleep on the couch due to your spouse not appreciating your monster attacks? You've found just the game! Do you have a passion for game expansions that may not seem to make any logical sense, but are quite fun? Alvin & Dexter is for you! 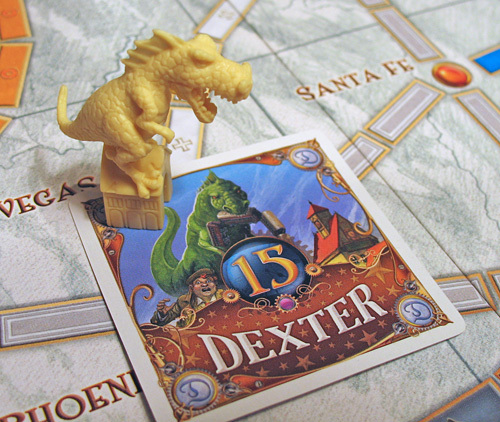 Since the release of Alvin & Dexter, there have been some questions raised regarding situations that were not covered in the official rules released with the game. 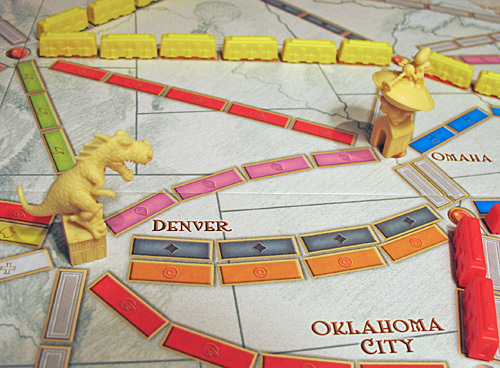 These have often specifically dealt with other Ticket to Ride versions that utilize unique elements, such as Stations. The game's creator, Alan Moon, has been answering those questions and compiling a master set of clairifications. Here's a summary of what's been created to date, should you pick up this expansion and have questions. A Station1 cannot be built in a city with a Monster. A Depot2 cannot be built in a city with a Monster. A Passenger3 cannot be moved out of, into, or through a city with a Monster. A Monster can be moved into a city with a Station1, Depot2, or Passenger3. If a Monster is in a Country4 location, the whole Country4, not just the specific space, is in Chaos. Cards cannot be added to or taken from a Depot2 in a city in Chaos. At the end of the game, a Station1 in a city in Chaos can still be used normally. 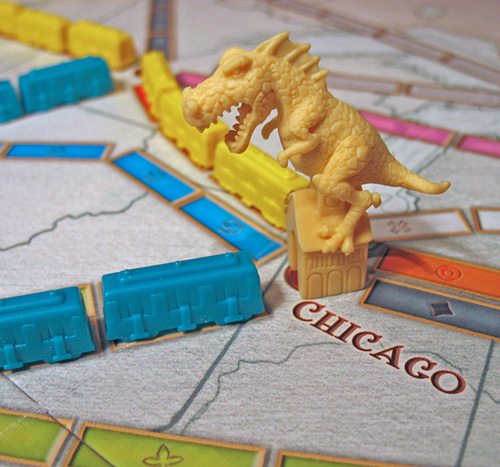 If both Monsters are in the same city at the end of the game, Destination Tickets that include this city are only halved (not halved twice). When you move a Monster, you must move him at least one space, you cannot retrace steps (as in moving one city forward and then one city back), and you may not end the Monster's movement in the same city where it started the move (by moving in a loop).